इसी को कहते हैं बदला. वो जब पत्नी बदला लेने पर उतारू हो जाए तो पति को हर तरह से तबाह कर डालती है. कांग्रेस नेता रहे और 'पाजिटिव मीडिया' नाम से एक मीडिया हाउस चलाने का प्रयास करने वाले विवादित शख्सियत मतंग सिंह हर मोर्चे पर अपनी पत्नी से हारते जा रहे हैं. मनोरंजना और मतंग के बीच पाजिटिव मीडिया हाउस की हिस्सेदारी को लेकर कंपनी लॉ बोर्ड में मुकदमा चल रहा है. इसी बीच खुद को परम चालाक समझने वाले मतंग सिंह ने नवीन जिंदल पर डोरे डाले और उनका पैसा लगवा लिया. जी ग्रुप से जले भुने जिंदल के मन में एक मीडिया हाउस खड़ा कर जी ग्रुप से बदला लेने की भावना थी, सो वो मतंग सिंह के बिछाए जाल में फंस गए और अरबों रुपये का निवेश कर डाला. Pls find attached a copy of the order by Company Law Board (CLB) dated 19.11.2013. 1. The Hon'ble CLB Court has directed that the agreements signed and already executed between the parties ( namely Matang Sinh of Positiv Television Group of Companies and Navin Jindal of Jindal Steel and Power and various associate companies) be stayed with immediate effect. 2. The Hon'ble Court has asked the Jindal associate companies as well as Navin Jindal to show cause why the existing order of the Court was violated in entering into these agreements and for the same reason why the Court should not move ahead and terminate or set aside these agreements. 3. The Court has restrained the two parties from acting further in any respect of the signed agreements including agreements dated 30.01.2013 and the security agreements dated 30.01.2013. 4. 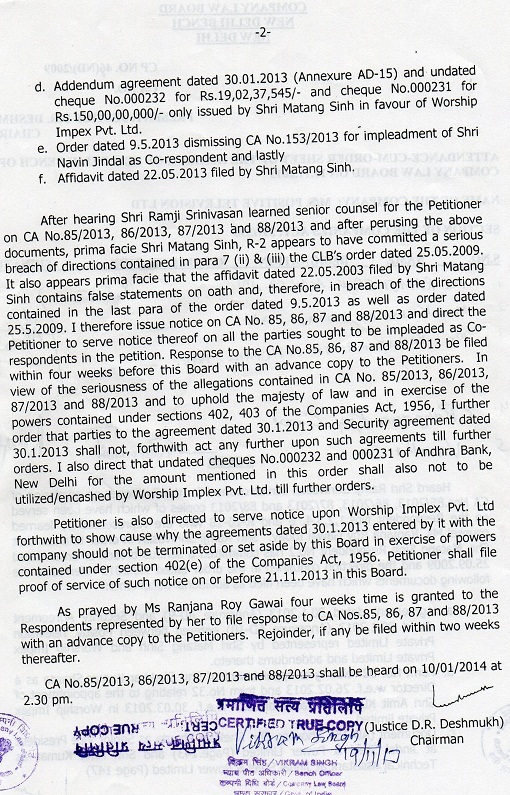 Notices have been issued to Navin Jindal, Matang Sinh, Jindal Steel & Power Ltd, Shekhar Kumar Sharda (Senior Vice President of JSPL), Amit Kumar Jha (Technical Assistant to Navin Jindal at JSPL), Santosh Singhal, Poonam Sharma and Positiv TV and its associate companies, Worship Impex and R Arora & Associates. 5. The Court also noted that the affidavits filed by Matang Sinh in which he denied any agreement or association with Navin Jindal directly or indirectly "contained false statements on oath before the Court and therefore are in breach of directions of the Company Law Board". Since there is prima facie evidence, the Court will now initiate contempt and perjury proceedings against Matang Sinh for lying on oath before the Court. Contempt proceedings will also be started against Navin Jindal who abetted Matang Sinh in gross violation of the Court order. Navin Jindal had entered into a series of agreements totalling approximately Rs 250 crore with ex-MP Matang Sinh's company Positiv Television Pvt Ltd in January 2013. Since there was a Court order dated 25.05.09 for status quo on all shareholding and fixed assets of Positiv group of companies, both the parties knew very well that any further agreement to part with the shareholding or fixed assets or create a lien or mortgage of any kind would be a violation of the Hon'ble Court's order. Despite this, both parties entered into a series of agreements flouting the Court order. Through this move, Navin Jindal was attempting to make a backdoor entry into media and take over the sick Positiv group and its 6 satellite TV channels and 4 FM radio stations. This order is to be seen in the backgound of the recent reports in media stating about the ambitions of Navin Jindal to become a media baron and acquire a clutch of running TV channels and radio stations. Navin Jindal, a Congress MP, has been fighting a war with a national TV channel Zee TV and its owners alleging that the journalists of that group had sought to blackmail him and his companies. It is pertinent to point out that the agreements between Navin Jindal and Matang Sinh total above of Rs 400 crore which is the investment that he has made to acquire these sick TV channels and radio stations. However, at the moment agreements worth only Rs 250 crore are in the possession of Manoranjana Sinh, estranged wife of Matang Sinh who was earlier CMD of the Positiv Group of companies. She has disclosed before the Court that she is in possession of only some of the agreements that violate the Hon'ble Court's orders but there are many other agreements between the two parties. Manoranjana Sinh filed a case against Navin Jindal and his group of companies some months ago but the petition had been dismissed by this Court as she was not in possession of actual signed agreements. Manoranjana was the founder-promoter-director of the Positiv Group of companies and a 50 per cent partner along with her former husband Matang Sinh. She was designated CMD and Editor in Chief. The channels in question are Northeast Television, NE Bangla, Focus TV, Hamar TV, HY TV and NE Hi Fi. The FM radio stations are located at Agartala in Tripura, Shillong in Meghalaya, Guwahati in Assam and Itanagar in Arunachal Pradesh. Manoranjana had filed a petition before the CLB way back in 2008 alleging that her former husband had illegally removed her from the Board of the companies as she had filed a case of 498 A and domestic violence against him in Guwahati. Meanwhile, this Court direction has come as a major blow for Navin Jindal who had taken over the media projects of the Positiv Group, dismissed all journalists working there and had brought in his own administrative and editorial persons. Although Manoranjana Sinh claims that she had informed him duly that his takeover was a blatant violation of the Court order, Navin Jindal went ahead and invested not just in clearing the heavy bank debts of the Positiv group of companies, but also bought new buildings and state of the art equipment for all the channels to revive them.